ULTRA SOUTH AFRICA has dropped a colossal fifth anniversary Phase Two lineup. Having recently announced the return of Dutch heavyweights Armin van Buuren and Hardwell, the festival ups the ante even further with additional headliners: Axwell /\ Ingrosso, Afrojack and Dubfire. The Cape Town event will be held on Friday, 9 February 2018 at the Cape Town Stadium, an iconic venue that runs through the heart of the Mother City. The emblematic stadium brings a truly unique flavour to the event, one that 2017 festivalgoers can attest to. The Expo Centre, Nasrec is the home to ULTRA South Africa in Johannesburg, and has been since day one. The event set the bar for electronic music festivals around the country, and will be no different this year when Ultranauts converge on Saturday, 10 February 2018 for yet-another mind-blowing electronic music experience. To relive the magic, watch the 2017 Aftermovie here. 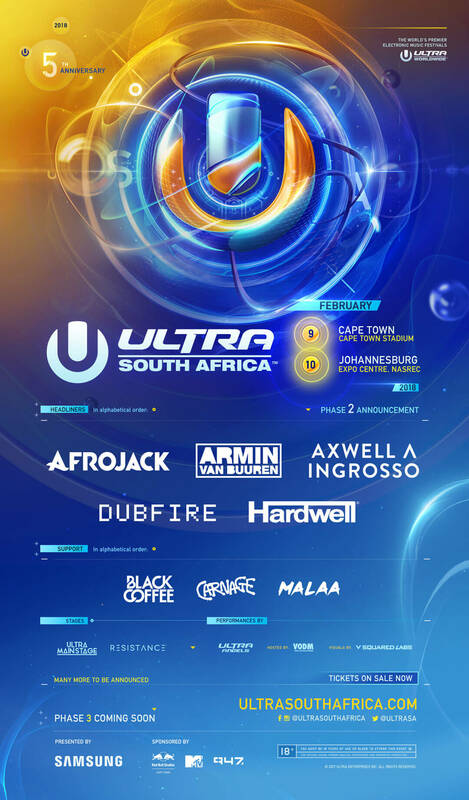 Tickets for the fifth anniversary, presented by Samsung, are on sale exclusively at ultrasouthafrica.com. Booking fees are excluded from prices. Follow ULTRA South Africa on Facebook, Twitter and Instagram for real-time updates on artists, tickets and festival updates.